In a way, I was lucky not to have any of the major organs affected. But yet it’s still hard to comprehend and come to terms with, yet life carries on. I hope that it can be controlled and that it doesn’t progress further for a while. I have treatment every 3 weeks for life, forever. I will have to continue treatment otherwise the cancer will return and spread. A treatment may fail to help stop the cancer and progression means you have to use another line of treatment. Treatment hopes to control the cancer. Again people don’t understand this, yes I may have hair on my head and be able to exercise but I have an incurable disease. I have my bad days, days when I get a migraine from the treatment and I cannot function, aches and pains due to the drugs that I’m on, pain from the peripheral neuropathy in my feet (worse) and fingers but currently I’m doing OK. The figures are shocking, 12000 people die every year, from secondary breast cancer, 1000 die every month in the UK alone. Worldwide around 1430 die EVERY DAY. There is no cure. Yes, people are living with and beyond cancer but the average of 2-3 years life expectancy is still hard to accept. This is not yet a chronic disease and people are dying much too young. We need a CURE. 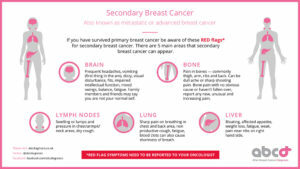 I created an infographic to explain this and to help primary patients recognize symptoms of secondary breast cancer. If you do experience any of these symptoms then don’t hesitate your Oncologist as the sooner you get treatment the better. There’s lots of information on various Breast Cancer charity websites about secondary breast cancer and special days or meetings for people living with this disease. You will find the links to the charities and organizations in the links section of the web site. Lastly, research is critical to getting better drugs to live longer to eventually make this a chronic disease like for example diabetes or asthma but we are a long way from that yet. The ideal is a cure. We all live with hope. ABC Global Alliance – Improving and extending the lives of women and men living with Advanced Breast Cancer in all countries worldwide and to fight for a cure. We will also raise awareness of ABC and lobby worldwide for the improvement of the lives of ABC patients. Europa Donna – The European Breast Cancer Coalition. METAvivor (USA) – non profit organization dedicated to increasing awareness of advanced breast cancer and equity in research for patient support. METUPUKorg (UK) An advocacy group aiming to turn metastatic breast cancer (MBC) into a chronic illness and support MBC patients.